available at resorts in a pocket-size format (like a trail map) and/or an online/mobile version to all guests with education about making good decisions to have a safe experience. The safety guide will be complemented by a series of public service announcement videos featuring Olympic gold medalist Maddie Bowman and professional snowboarder and founder of Protect Our Winters (POW) Jeremy Jones. Reitzell and Ohran unveiled the new Mountain Safety Guide and public service announcements at Sports Basement in San Francisco, which is among the many sporting goods stores already seeing an increase in customers following last winter’s great ski season. As California and Nevada resorts gear up for the 2017-18 season, Reitzell hopes that, along with last year’s record winter snowfall that extended operations at some resorts into summer, the upcoming 2018 Winter Olympics will draw even more skiers and snowboarders this year. Joining in today’s announcement was Chase Allstadt, a veteran ski patroller, and Ike, a rescue dog from Squaw Valley | Alpine Meadows. Allstadt said the Mountain Safety Guide will help skiers and riders focus on speed and control, two of the most important factors when it comes skiing and riding responsibly. control and be able stop safely. Most serious injuries occur from collisions at high speed. The educated skier is a safer skier. The smart snowboarder is a safer snowboarder,” Allstadt said. The guide contains safety education every resort guest should know, covering everything from what to do before going to a resort, to loading and riding lifts, navigating potential hazards – including deep snow and avalanche awareness, and understanding trail signage. The guide is printed on reclaimed stone without using trees or water, and is waterproof and tear-resistant. The video public service announcements are separated into three categories: safety education for children and their parents; being “Park SMART” in terrain parks; and specific guidance for new skiers. 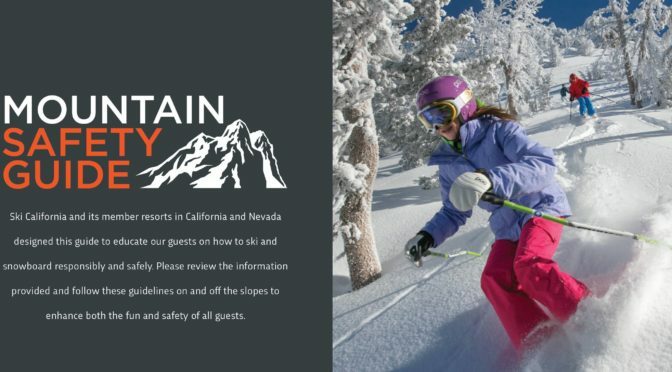 The Mountain Safety Guide is supported by the Association of Professional Patrollers, the National Ski Patrol, the National Ski Areas Association, the U.S. Forest Service, the American Association of Snowboard Instructors, the Professional Ski Instructors of America, the Sierra Avalanche Center, the High Fives Foundation, and Ski California’s lead sponsor, KÜHL clothing. To check out the new Mountain Safety Guide for yourself, click here.